Posted in: Daytime Sky, DSLR, Telescope. After some solar observing earlier, I set up my scope in the twilight and enjoyed the almost full moon. I used a Baader Hyperion 8-24mm zoom to quickly zoom in and out on interesting features. I found that a light blue filter increased the contrast nicely. Once it got um, sort of dark (well, it is Northern Summer with a fullish Moon), I worked my way through a few new Messier objects. And finally, the blue-yellow double star Albireo in Cygnus. Beautiful weather continues, so fitted solar filter and sol searcher finder. Finderscope remained covered up and used the “pinhole” camera of the Sol Searcher instead. I held the filter up to the Sun to check there were no defects or tears prior to fitting it. Overall, I would say that it reduced the luminosity of the Sun to about the level of the full Moon. Enjoyed good white light views of photosphere. One very large sunspot with penumbra and smaller companion. Sun seems quiet – at least at that level. Would need hydrogen alpha scope to see corona. 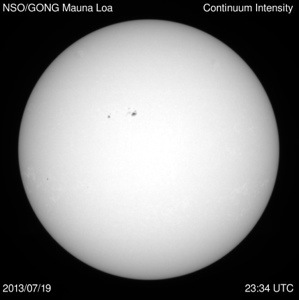 Yup, just a pair of sunspots visible – doubtless all the real action is in the H alpha. 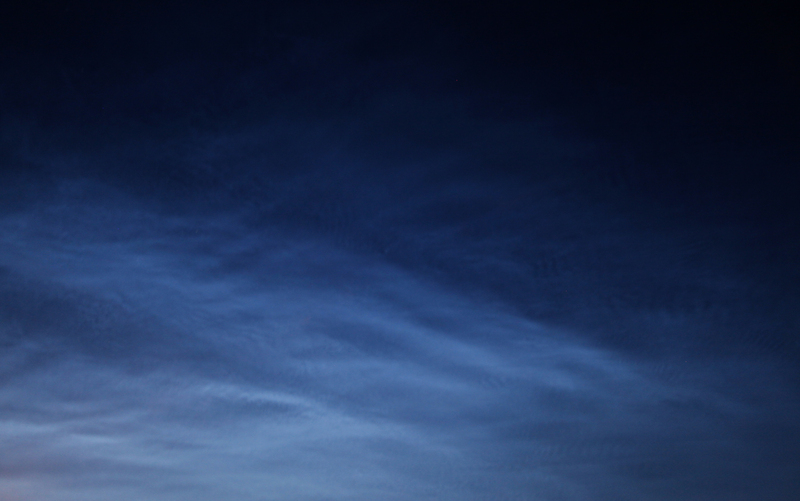 Stepped out at 1115pm last night to look at the Northern sky – Saw some noctilucent clouds – Not that intricate or layered but thought I would take a shot. These clouds are about 80 – 90km high and catch the last rays of the Sun. They are said to form on dust from meteors and comet dust tails. Im not that fond of clouds… interferes with my astronomy. Its not really the clouds’ fault, I guess I should learn to love them more. So heres my first attempt at patching the relationship.